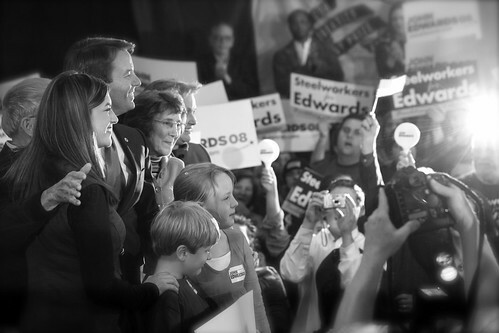 I remember lingering around a half-empty ballroom at a Des Moines hotel this past January after John Edwards left the stage and many of his supporters had filed out of the room. It was obvious that Edwards' second place finish would damage his chances of winning future states and becoming the Democratic nominee, but I felt like I had witnessed an amazing moment in election history. 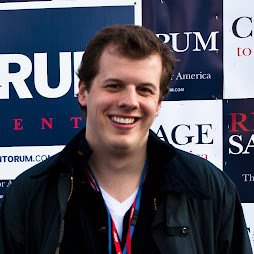 For someone who's listened to every candidate's stump speech numerous times, I felt like Edwards had broken from the mold and was speaking fromt the heart. As the Democratic field narrowed down to Obama, Clinton, and Edwards through January, it seemed only a matter of time before Edwards would have to drop out, but I still loved seeing him on debate stages and delivering his talking points on television. Up until yesterday I wished Edwards had been the nominee instead of Obama; I thought he had a better chance of winning this November. Now, after meeting Edwards twice (once privately for an interview), publicly voicing my support for him, and arguing on his behalf to friends and colleagues, I can't help but feel outraged that Edwards would hide such important information for so long. As every Democrat is aware, the most important criteria in choosing a nominee for the party this year is electability--finding someone who can beat John McCain and put a Democrat back in the White House. That a major presidential candidate would withold a scandal (while maintaining innocence and touting his amazing family values) that would have destroyed his campaign and elected John McCain overnight, shows John Edwards' true motives: being elected President was more important for him than having a Democrat elected in 2008. I (still) love Edwards' 2004 and 2008 political platforms, but he will never be the same in my eyes.